We've added a little something special in the photo gallery... some BEHIND THE SCENES shots for our fans to see! This is just a taste, and there will be more to come, but head on over to the full gallery to see the rest! May 7 - Indy-West Harley Davidson! Come see us on Saturday, May 7th, at IndyWest Harley Davidson's Customer Appreciation Day! The event lasts 9am-5pm and they'll have all sorts of surprises in store for you, as well as your favorite DEAD BAND to entertain. Get all the info you need over at IndyWest Harley Davidson. Fans, we have some HUGE news to let you in on! We've added some show dates to our schedule.. 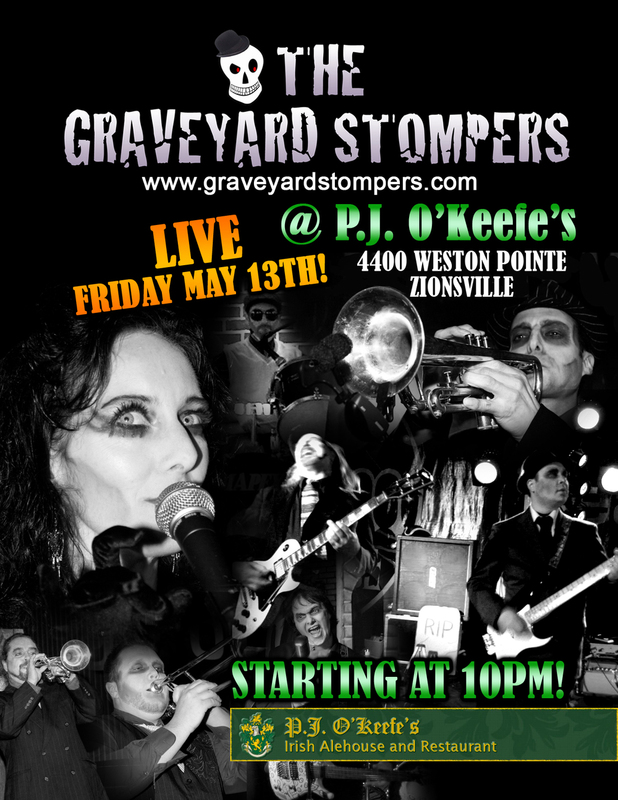 Including a special FRIDAY THE 13TH show at PJ O'Keefe's in Indianapolis. Stay tuned for more details as times are finalized. Can't wait to see you there!! "KILLER'S TOUCH" ALL THIS WEEK ON RUE MORGUE RADIO!!! 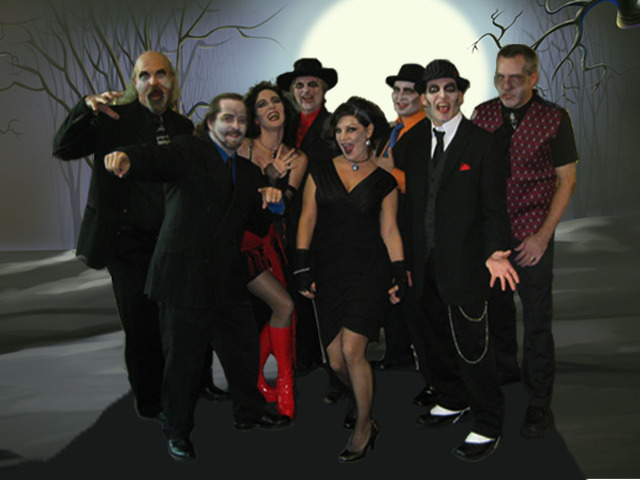 ‎"Killer's Touch" is playing all this week on Rue Morgue Radio! If you're not a fan yet of Rue Morgue Magazine or Rue Morgue Radio, get on it. Dig it, Gravediggers! LISTEN TO US ON RUE MORGUE RADIO!!! From November 5th - November 11th you can hear us on Rue Morgue Radio, THE place to get your horror culture fix! Lots of great stuff in this broadcast, including Part 3 of their interview with Guillermo Del Toro. We conclude the broadcast with "Goin' Commando". Enjoy! From all of us, we want to wish all of our fans a Happy Halloween! Thought we'd show everyone our "digs" as you take a stroll through our graveyard. Enjoy. Now get out there and scare somebody this weekend, will ya?! The first review has rolled in on Rise to the Occasion.. take a look at what Nuvo had to say about us! Killer's Touch OFFICIAL MUSIC VIDEO! On the set: The "Killer's Touch" Music Video! The band had a blast on Saturday filming scenes for the "Killer's Touch" music video! We can't wait for you to see the finished product, so check back soon for more information on its release. Meanwhile, take a look at the gallery of photos shot on location at The Asylum House in Greenwood, IN. Rise to the Occasion - ON SALE NOW! Available on your other favorite retailers soon! The season will soon be upon us. Your favorite undead band is ready to leave the graveyard once more and rock. Check our tour dates page often to see where we'll be stomping next. NEW PICTURES FROM ASYLUM HOUSE UNEARTHED!!! Digging around our coffins we've found new pics from our October 2009 Asylum House show! Yes, I know it's now 2010, but time means nothing when you're dead. Keep your eyes and ears open for the next time we rise from our graves and rock a stage near you. CHECK OUT OUR NEW PROMO VIDEO!!! Hey, You! Look over to the right of this blog posting. It's our brand new PROMO VIDEO! This montage video features a sample of our original "Killer's Touch" (copyright 2009) and shows us at our best performing at the Asylum House haunted attraction. So crank up the speakers, sit back and enjoy! We've just posted some new photos from our gig at the Children's Museum VIP Party. It was a spooky good time. Check 'em out in our photo gallery. More to come from our other gigs. Stayed tuned for video clips too! October 24th - The Asylum House!! Hey Fans! Be sure to check us out TOMORROW NIGHT when we RETURN to The Asylum House in Greenwood!! We'll be playing at 8PM and go on for 3 HUGE sets to entertain you while you wait for one of Indiana's scariest haunted attractions! HAVE A CAMERA? If you take any photos at ANY of our gigs, INCLUDING TOMORROW IN GREENWOOD, contact us via our Book Us page and let us know! We'll contact you and post them on our site AND we'll share a link to your website. It's gonna be a great time and we ALL hope to see YOU there!!! It's been a crazy past two weeks! We had two great shows at The Children's Museum kicking off the opening of their "Tomb of Doom" haunted house. It was great seeing all of the kids dressed up in costume. We even had a little skeleton rocker jam with us! Last night we played at The Witches Ball in Muncie. We had a blast! It was great showing the Muncie crowd how we stomp. Thanks to Keith and Christine for having us. We hope to be in Muncie again soon. Stay tuned for pics and videos from our shows. Don't forget about our show at The Asylum House on Oct. 24th.